All photographs in this article were taken by Ragnhildur Jónsdóttir, who also provided the captions. 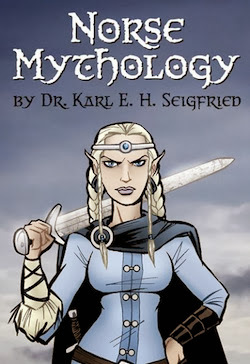 She has kindly allowed me to use them on The Norse Mythology Blog. Last December 22, the Associated Press posted a story titled “Iceland’s Hidden Elves Delay Road Project.” It discussed how protests in Iceland had temporarily halted construction of a road through the Gálgahraun lava field on the Álftanes peninsula – an area that was declared officially protected in 2009 – until the country’s supreme court could rule on the case. The story downplayed the fact that environmentalists had been publicly battling the project since its inception. Instead, it focused almost exclusively on the idea that “elf advocates” was leading the protests because the construction was invading an area inhabited by elves and containing an elf church. The Associated Press item was picked up and reposted by news agencies around the world, with unfortunate results. Here in Chicago, WGN-TV News used images of the cartoon Keebler Elves to illustrate their giggly coverage of the story. National Public Radio’s website repackaged the AP article as “Highway In Iceland May Be Sidetracked By Elves” (it seems that we’re now capitalizing prepositions) and illustrated it with an image of Liv Tyler as Arwen from The Lord of the Rings. Apparently, they’re following the lead of Public Radio International, who used a photo of someone dressed up as Marvel’s movie version of Thor to illustrate a story on the U.S. Department of Veterans Affairs finally allowing Thor’s hammer as a religious symbol on government grave markers. For news agencies the world over, the AP item was just too cute to pass up. Who wouldn’t want to tell the story of a simple island folk and their quaint belief in invisible beings? It’s much easier than doing nasty time-consuming things like researching and interviewing sources. It’s also much easier than the bothersome chore of learning about minority faith traditions and treating them with the same respect as popular religions. All of this is a bit strange. The fundamental premise of the original AP story is that “elf advocates have joined forces with environmentalists to urge the Icelandic Road and Coastal Commission and local authorities to abandon a highway project building a direct route from the Alftanes peninsula.” However, Gottlieb does not quote any “elf advocate” involved in the protest – except for the two sentences from Ragnhildur. In its response, Icelandic Review Online simply states, “The story is false” – but didn’t seem to have bothered contacting Ragnhildur for her input. The Wire, while criticizing Gottlieb’s journalistic methods, shows no sign that it conducted a single interview of its own; the piece was written by “cobbling together quotes” just as much as the AP story was. 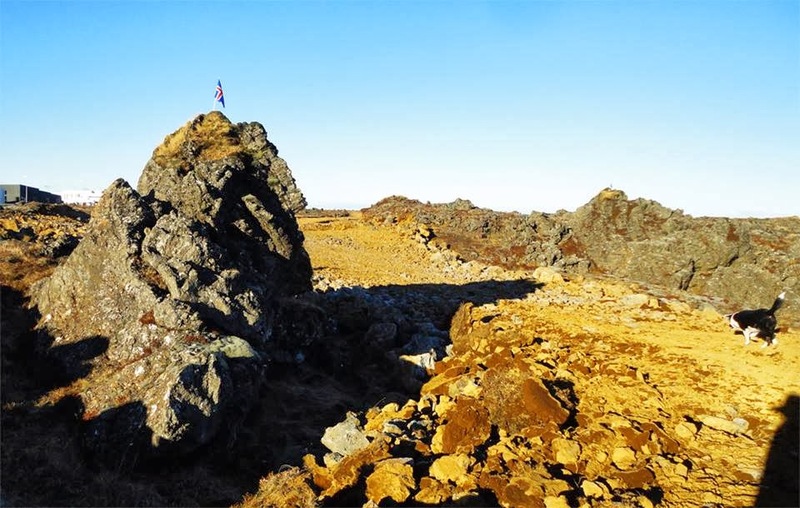 The Reykjavík Grapevine – the originator of the “cobbling together” accusation – likewise created its response by sticking together existing quotes (including a Facebook status update) instead of doing any original interviews. Where are Gottlieb’s interviews with others in the supposed group of “elf advocates”? Was the entire premise of the story built on a two-sentence interview with Ragnhildur? Why didn’t any of the writers criticizing the AP piece bother to interview Ragnhildur for their own stories? Would the Associated Press have identified a Catholic priest involved in the protest as “a self-proclaimed ‘holy man’”? Would Icelandic Review Online refer to a Jewish demonstrator as a “self-confessed Yahweh believer”? Would The Wire refer to a Muslim protestor as “loony” and put imam in sarcastic quotation marks? 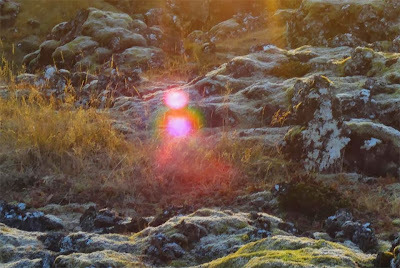 I have corresponded with Ragnhildur for several years, and I met her in at Þingvellir in Iceland after participating in the sumarsólstöðublót (summer solstice ceremony) of the Ásatrúarfélagið (“Æsir Faith Fellowship”) in 2010. As Iceland’s leading elf specialist, she leads elf walks through Álfagarðurinn (“elf garden”) in Hafnarfjörður and creates original art based on her contact with the elves. I wrote about her public work when covering a 2012 “Elf Kerfuffle in Iceland” that also involved road construction and elf habitats. Hello and thank you, Karl Erik. Yes, it is a wonderful story, but I am so sorry to say that it is not completely true. The Road Administration is still working on the road. They are halfway through the lava field with the road, but the elf church and their holy area is still in place. The elves (with me as their speaker in the human world) have come to an agreement with the Road Administration and Garðabær’s mayor to move a known elf church called Ófeigskirkja a few meters out of the way of the road into a safe place next to a very sacred place to the elves. The humans will make sure nothing of this will be damaged and it will be marked as an elf holy area. I know it will be too hard for the humans in charge to stop the road from being made, but they are at least willing to help the elves now as they can, to make the best of the situation as it is. I am very happy that the mayor and the Road Administration are willing to do this now; it is a good step. This project of moving the Ófeigskirkja is a very large project, plus making sure the whole area is safe and protected from then on. I am sure you will hear about that when it happens. Best elf wishes to you and thank your interest. Thank you for all you are doing. Hello Karl, I promised to tell you about the protection in the Gálgahraun lava field. I have now met again with Magnús from the Road Administration and some of the men working on the road. They showed me drawings with changes of the road where it goes by the side of the elf church (holy place). They are going to move one known elf church (more like a chapel) out of the way of the road. It will be placed a few meters away, right beside the main holy place that we call Elf Church. 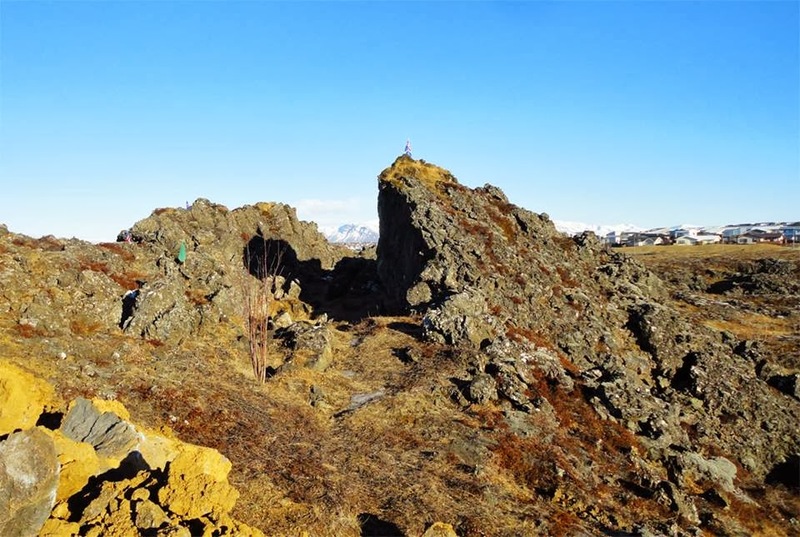 One more elf rock called Grænhóll (Green Hill) is also being saved. The road is going to be four meters narrower while passing this area of three rocks. It will be fenced off from the road, and pathways will be leading to the area from another direction. The road being narrower means that the road itself is the same width but the area beside the road [i.e., the shoulder] is made narrower. Anyway, wanted to tell you this. Thank you for your interest in this, Karl. I have heard from the man Magnús at Vegagerði (Road Administration). They are going to move the Ófeigskirkja in the middle of March. This rock called Ófeigskirkja – a kind of an elf chapel – is in the middle of the road they are making. They will move it out of the way to a nearby, almost flat lava. It is right next to the main elf church or holy place. That means the two holy places – high energy places – will both be saved and protected there, next to each other. 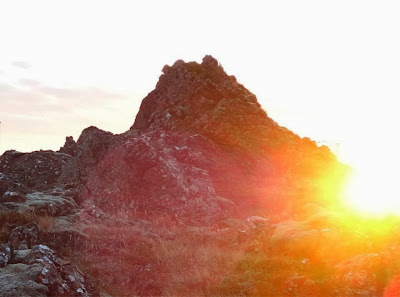 There is the third rock, known as Grænhóll; it is very close also. Finally, she was kind enough to send additional photographs of the area with detailed explanations. 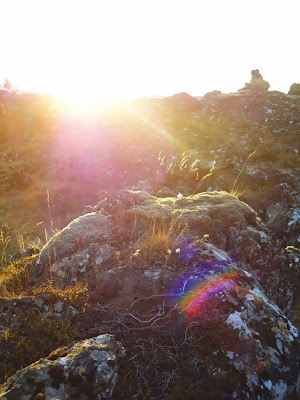 I am sending you two photos from the sacred place in Gálgahraun lava field. This first one shows the new road. In front to the left is Ófeigskirkja. It is an “elf chapel,” so to speak. The elves told me humans and elves said a prayer there before or while going through the rough lava field. This big rock is in the middle of the new road, but the Road Administration and the mayor of Garðabær are making changes. They will move this rock over the road where you see the dog. The main elf church is in the back to the right, with a flag on top. The second photo shows the main elf church or holy place. This beautiful place is so very special and has great, very high energy. The beings there tell me it has been a holy place for them for thousands of years, since long before humans arrived here – and they will protect it. Ófeigskirkja will be put down right next to this one. The road is narrower where it goes past this area. They will fence it off from the road and put up signs to say what it is. If the elves had done nothing, this whole area would have been destroyed. I hope this helps. Next month they will move Ófeigskirkja and we will probably have something in the news then, at least. I will let you know and I will post about it on Facebook. Best wishes for you and thank you for your interest. There you have it, gentle readers. Make up your own minds about the original story, the critiques, the letters and the photographs. I simply thought that the professional journalists on both sides of the issue could use a bit of reminding about original research, speaking to sources and following up on a story as it develops after the initial AP report. My faith in modern journalism keeps getting lower as, for example, I repeatedly catch reporters in the mainstream media who are writing articles by literally cutting and pasting from Wikipedia articles. I’m not sure if this is a problem that saturates all areas of journalism today, or if it’s localized to religion reporting. Journalists who cover the religion beat seem particularly perplexed when confronted with any belief systems outside the Abrahamic mainstream. I would love to see (to use a tired but apt phrase) fair and balanced coverage of minority faith traditions, but it’s sometimes hard to keep my hopes up – especially when we have shoddy reporting like that surrounding this particular story. This is a GREAT article, and I'm so glad that any administration is willing to work with people to preserve places of power, and those that perhaps cannot commonly speak for themselves. I wish more would do this. 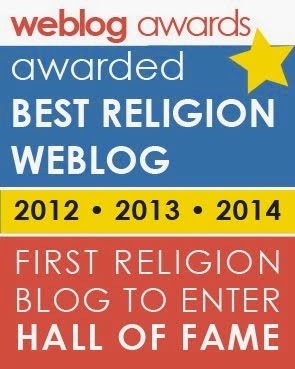 The disrespect to the old way religions (whether it be Ásatrú or Kemetism or whatever else) is mindboggling. Some are more equal than the others, I guess. I would also think it is widespread of journalism. Here we suffer the same from political coverage (including international matters). It is sad that the very countries where such beliefs originated, disregard and disrespect them so blatantly. Your friend appeared in this film, didn't she? Ragnhildur says, "I was there, just for a few seconds, I think. But I was there."